Candied pecans are a holliday treat for me, and they make great gifts when jarred and tied with a ribbon. Many grocery stores sell bulk nuts which are also less costly than prepackaged nuts. This was the first time I tried this recipe and I found it to be the easiest with the best results! Place pecans on a parchment lined cookie sheet, in a 250° oven for 10 minutes or until warmed. Grease a 15-in. x 10-in. x 1-in. baking pan with 1 tablespoon butter; set aside. Grease the sides of a large heavy saucepan with remaining butter; add sugar, water, salt and cinnamon. Cook and stir over low heat until sugar is dissolved. Cook and stir over medium heat until mixture comes to a boil. Cover and cook for 2 minutes to dissolve sugar crystals. Remove Cover then cook, without stirring, until a candy thermometer reads 236° (soft-ball stage). Remove from the heat; add vanilla. 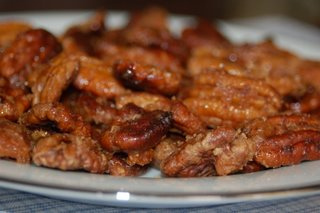 Stir in warm pecans until evenly coated. Spread onto prepared baking pan. Bake at 250° for 30 minutes, stirring every 10 minutes. Spread on the parchment lined cookie sheet to cool.